Author: Roth, Susan L. Set In . . . 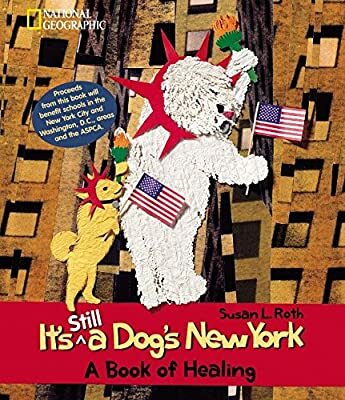 Description: In this parable of childhood bereavement, Pepper and Rover, two New York dogs, are miserable after the tragedy of September 11, 2001. Pepper feels overwhelmed with sadness and fear and anger. But in a tour of New York City, his friend Rover shows him that even though they?re sad, they can go on. Pepper learns that helping others, expressing his feelings, celebrating the bravery of rescue workers, and allowing himself to enjoy life can lead to healing; that the pair are not underdogs, but top dogs; that Americans are strong enough to survive and thrive, that It?s Still a Dog?s New York.